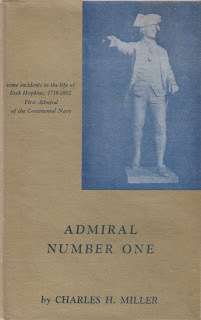 Our book today is a rabble-rousing little thing called Admiral Number One by Charles H. Miller, and its subject is Esek Hopkins, Rhode Island sea captain and first admiral of the fledgling Colonial Navy. Esek was the younger brother of Stephen Hopkins, a delegate to the Continental Congress and a true and worthy patriot. Which just goes to show you how much variety there can be in brothers, because the early years of the American Revolution have few worse scoundrels in them than Esek Hopkins. It's almost surreal, finding a little book like this one whose sole intent is to praise the man. Charles H. Miller is, as he tells us many times, a descendant of the Hopkins "clan," and he admits his brief biographical sketch isn't all that objective. He sets out to prove that Esek Hopkins was a great hero of the Revolution, unfairly criticized in his own day by profit-minded "men of the city" and unfairly neglected by posterity. Miller even manages to find a statue of his hero, to adorn the front cover of his book. Families are entitled to write partisan histories, and Esek Hopkins will likely remain an obscure figure no matter what anybody writes. 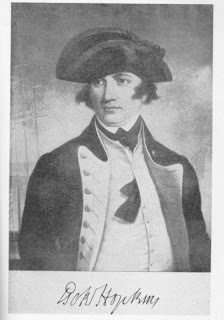 Even John Paul Jones, who served under him, would have been reduced to a footnote if his entire Naval career had consisted of sitting on his hands in Narragansett Bay day after day, completely blockaded by the gigantic British fleet. But it wasn't just circumstances that contrived to bury the name of Esek Hopkins. The man's own cowardice, coarseness, stupidity, cupidity, and incompetence factor in too. Miller makes no claims to be a formal historian (his calling Samuel Adams "John Adams' brother" would have scuttled such claims in any case), but he's looked at enough Hopkins family documents so that you'd think he'd have skipped writing Admiral Number One in the first place, but no. Esek Hopkins was born in 1718 in Rhode Island, the fifth son of a large hardscrabble family that could scarcely clothe and feed him, let alone school him, with the result that he was borderline illiterate his entire life. He grew up tall and dopey-looking, with a bovine expression that could pass for handsome if the lighting were poor enough. At age 20, he signed as a deckhand on one of the many slaving vessels running out of Newport, and because he brought to this enterprise both a Rhode Islander's natural affinity for seafaring and a Hopkins' natural indifference to human suffering, he was able to rise quickly - deckhand, officer, master ... and eventually owner, of a bouncy little sloop he renamed Desire, after his new bride Desire Burroughs, daughter of a very prosperous Newport family. She brought him a thumping great dowry - and a baby, born miraculously soon after the wedding feast. As early as 1741, Esek Hopkins had been given a letter of marque by the Rhode Island Assembly, authorizing him to "subdue, seize and take any men-of-war or other vessels belonging to the King of Spain, wherever they be found." As captain of the privateer sloop Wentworth, of ninety tons burden, he evidently made the most of his opportunities, for within the next six years he gathered enough worldly goods, original owners not mentioned, to come ashore and settle down to a mercantile existence. Inexperience with husbandry prompted Esek to seek the seafaring life once more. Another incentive was the impetus given to the slave trade, since the African coast had been largely freed from the threat of French privateers, who up until then had driven almost all colonial vessels away from that area. Tobacco and rum were popular in the African coast, and so trade began to flourish once more, goods one way and slaves the other. Iniquitous, even at the time, but it didn't bother Esek Hopkins: he had money to make. And make it he did, rebuilding his family finances and buying a large estate outside of Providence (run by experts, this time). And he'd have settled there and lived the life of a typical back-country squire, except for the American Revolution, and the fact that Esek's older brother Stephen was always in the mood for some open-air nepotism. So 1775 came around, and Congress was prompted to name Esek Commander in Chief of the fledgling colonial navy - at the start consisting of his flagship the Alfred (commanded by that thoroughgoing dolt, Dudley Saltonstall), Columbus, the Andrew Doria, the brig Cabot (commanded by Esek's son), the Providence, and three smaller craft, the Wasp, the Fly, and the Hornet. All together, about 150 guns parceled out among seven extremely seaworthy craft - with only two problems: 1) at almost no time did any of these vessels have full or near-full complements of competent men, and 2) their opponent was the British Navy, which had ten times their firepower, ten times their vessels, and ten times their experience. The previous evening Governor Montford Brown had observed a fleet approaching, grew suspicious and ordered a sloop to rush 150 casks of powder from Nassau to a secret hiding place. This, in a measure, dashed Hopkins's hopes for a rich booty in powder, so essential for American resistance. It's true that the powder in question was essential for American resistance - the problem is, it was even more essential for Esek Hopkins' private fortune. Governor Brown, whose family was well-known to Hopkins from his slaving days almost twenty years earlier, had found the perfect "secret hiding place" for all that valuable powder: a safe harbor at nearby St. Augustine and eventually the hold of a sloop owned by the man who now had his ships' guns trained on Brown's peaceful little island. Miller gives no hint of this, probably because he didn't bother to dig deep enough to find it out - and besides, he's got bigger problems in defending his hero. On his return voyage from shaking down Fort Nassau, Esek and his squadron were in the sea lanes off the tip of Block Island when they encountered the British warship Glasgow (commanded by Tyringham Howe) on the high seas. A sharp exchange of gunfire ensued. The Cabot was mauled, but the Columbus (under Abraham Whipple) gave better than she got, and even the Alfred got in a few shots (unfortunately, under the direction of the dolt Saltonstall, some of these few shots found their way into some of Hopkins' ships). Captain Howe spotted the Andrew Doria coming up and decided to make a break for Newport Harbor, which was a perfectly sensible - though no doubt galling - decision. And Admiral Number One, Esek Hopkins, made the equally galling - though in no way sensible - decision not to pursue. He claimed to Congress (and, just in case they wanted a version with correct spelling and grammar, he made Paul Jones write a corroborating claim) that he had ever so many problems: the sea was choppy, the ships were damaged, the men were tipsy, and the first response he got - from Massachusetts' own ersatz privateering booby John Hancock - was "Great job!" Needless to say, further inquiries followed. Pretty much from the moment he let the Glasgow slip away, Hopkins was never out of legal trouble. Public favor turned against him, the complaints he'd always generated among his subordinates (he was a first-rate swearing man, and a brutal taskmaster, in addition to being a sloppy, forgetful, inconsistent moron) were given more and more public hearings, gentlemen (including gentlemen of the cloth) came forward to testify that his coarse and abrupt manner was actually hurting the cause of American independence. The time had been too long since Esek had seen his home. There he would be among his own kin, freed from a host of carping critics and poison tongues. A fortnight of utter peace in the bosom of his family, in an understanding atmosphere, might help to drown the flood of bitterness in his heart. (Leaving aside the question of how a flood can be drowned - and why that would be a good thing, even if it were possible - there's an obvious though bitter thought that naturally arises from sentiments like the above, i.e. how many hundreds of black men Hopkins removed forever from that utter peace in the bosom of their families, how many hundreds of such men - of such families - he had crammed into airless holds belowdecks and given one bucket of green water to serve all their thirsts for the next five weeks' voyage. Hopkins was as inept at slaving as he was at everything else; the mortality rates on his ships sometimes reached into the 90s). A thorough search of available records and sifting of what evidence is at hand disclosed the names of the "honorable gentlemen" who had engineered the conspiracy that hastened his suspension from the American Navy. But lest we be sued for libel or defamation of character by their descendants, we name no names! But you can rest assured, it wasn't just some small, shadowy cabal of "honorable gentlemen" who quickly saw through - and subsequently brought down - this hopeless charlatan. John Paul Jones had nothing good to say about his former commander, most members of Congress realized pretty quickly that they'd picked the wrong man for Number One, and every privateer and more-or-less honest merchantman Hopkins ever dealt with ended up with a poor opinion of him (and a strong urge to count the silverware whenever he left the room). 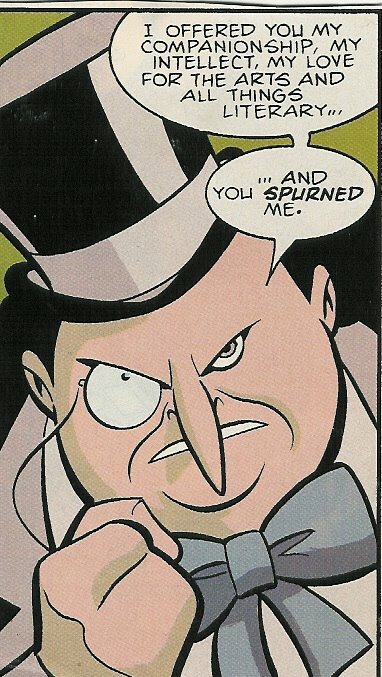 Boston importer (and sometime blockade-runner) Solomon Davis once pronounced about him, "He has the shape, the face, and the general thieving habits of a raccoon, but none of that animal's intelligence." At least, in Charles H. Miller, member of the "clan," he has one diehard fan. Everybody should have one, I guess.